What are low speed two-stroke Crosshead-type Marine Diesel Engines? Low speed two stroke crosshead diesel engines are generally used as prime movers on ships and are also used for electricity generation on shore based power plants. The term low speed is applied to engines having a rotational speed of up to 300 rpm and output per cylinder between 400 Kilowatts to 6000 Kilowatts generally. In these types of engines the piston is not connected to the crankshaft directly with the connecting rod but an additional member called the crosshead is provided. The piston has a long piston rod which sits on the crosshead. The crosshead converts the linear motion of the piston into the rotational motion of the crankshaft with the help of the connecting rod. The piston rod reciprocates up and down through the stuffing box which seals the crankcase from the under-piston space. The function of the crosshead is that it absorbs the transverse thrust of the engine. The isolation of the crankcase allows lower cost residual fuels to be burnt without the fear of any fuel contamination of the lubricating oil of the crankcase. The piston rings on the liner surface mostly operate under boundary or thin film lubrication conditions. The high operating temperature, pressure, and the presence of a corrosive environment make the working condition very harsh. 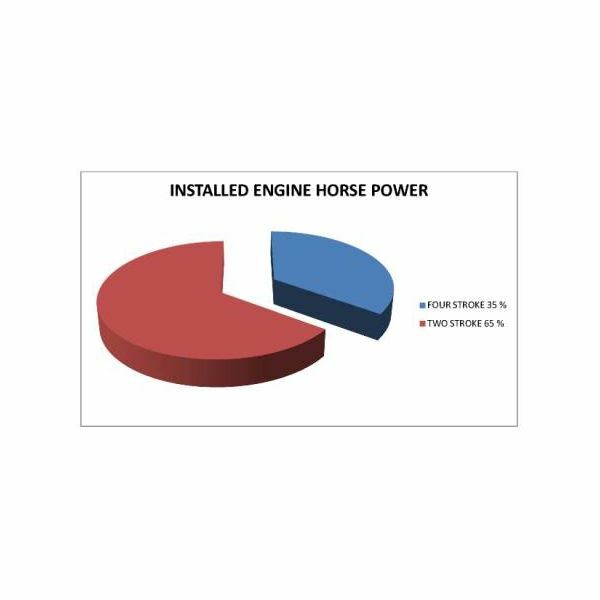 The two stroke crosshead type of marine diesel engines burning residual fuel provide the largest percentage of propulsive power for ships globally. 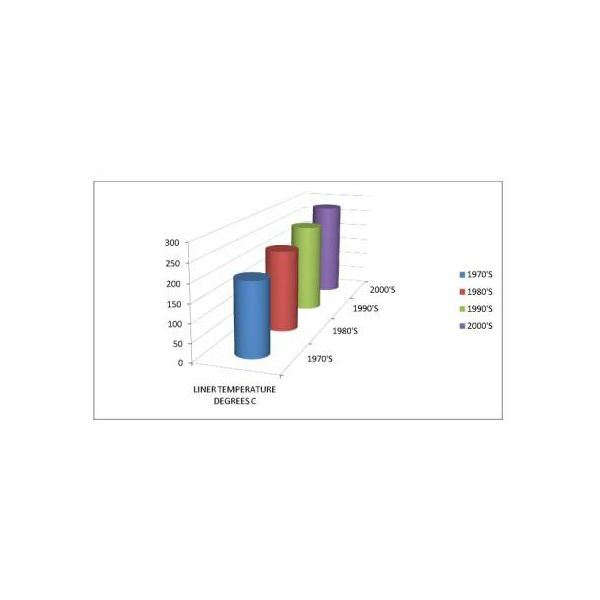 Over eighty percent of total lubricant consumption is on cylinder oil alone and it represents a major expense in the daily operation of the engine. Also over the years, engine developments aimed at giving higher output per cylinder and adapting the engine to burn ever deteriorating fuel grades have worsened the problem of cylinder liner lubrication. 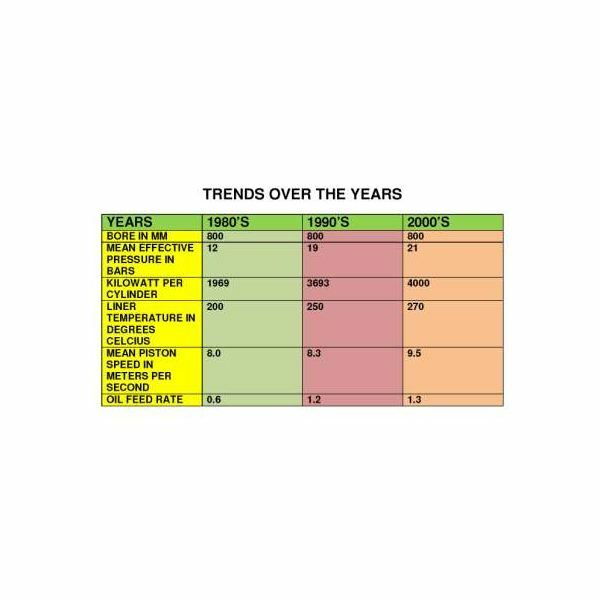 The liner average surface temperature has increased from 200 degrees C to 275 degrees C from the 1970s to the 2000s, thus making lubrication more difficult. Similarly the maximum pressure and mean effective pressure also have increased drastically. Please refer to the diagrams for the details. The use of low quality high sulphur content, viscous and residual fuel to cut down running cost has either created some new problems or aggravated the existing ones. The high sulphur content of fuels up to 4.5 % by weight has greatly increased the risk of cylinder liner and piston ring wear. Ash, either soluble or insoluble, in fuel can increase the abrasive wear of piston rings and liners. Mineral acids formed as a result of condensation of sulphur oxides produced during combustion create a serious hazard if they find their way into the crankcase. Incompletely burnt heavy ends of the fuel can cause excessive deposits in the piston ring zone. Short exhaust valve life due to deposit formation or corrosive attack by vanadium, sodium, sulphur, and other chemical compounds present either in the fuel or in the lube oil. Apart from aggravating lubrication problems, these fuels can damage injectors and corrode turbocharger nozzles and moving blades. 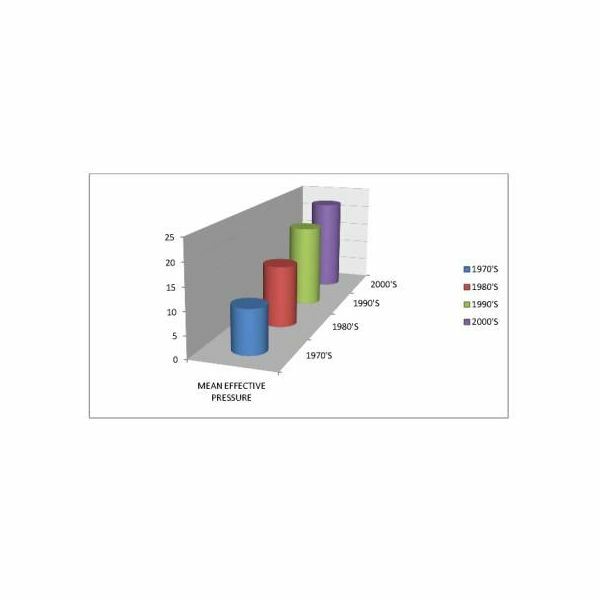 In addition to this, there is a wide variation in marine residual fuel quality according to their crude origin and degree of refining which make difficult the job of choosing proper cylinder lubricant. From the mechanical point of view, the working conditions are about the worst possible for the establishment of hydrodynamic lubrication. The piston slows to rest before reversing direction on the return stroke. Thus at top dead center where the temperature is at maximum and also the radial pressure of the rings on the walls is highest, the piston slows down. Under such extreme conditions it is impossible for hydrodynamic conditions to exist except perhaps about mid-stroke. 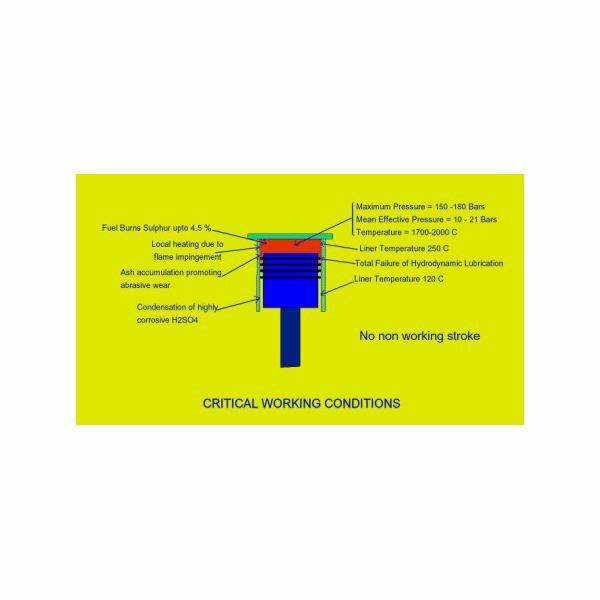 Gas temperature exceeding 1667 degrees Celsius are encountered at the beginning of the firing stroke and the local temperature may be appreciably higher if the combustion is poor resulting in flame impingement on cylinder walls. The temperature of water cooled liner surface varies from 230 degrees C to 120 degrees C depending upon the design. Engine developments from the 1960s to the 2000s have led to higher average temperatures of liners in the upper zone (about 270 degrees C), which has also made lubrication difficult. All modern marine engines are of two stroke type. So there is no non-working stroke during which the oil film on the wall can be reformed at moderate temperature and pressure. Again, all modern engines are fitted with diaphragm plates and piston rod glands, which effectively separate the cylinder from the crankcase. There is therefore no cooling effect of crankcase oil on the piston, cylinder lubrication being entirely dependent upon the oil supply by mechanical lubricators. This makes cylinder lubrication critical, and any deficiency in it may lead to failure of the engine. Engine development is basically aimed towards reducing cost of running, i.e. increasing the thermal efficiency, lowering the specific fuel oil combustion, and reducing the size and weight. This resulted in higher engine pressure, thinner oil film formation, high liner temperature, and increased corrosion. So cylinder liner lubricant needs to be competent enough to fight against these aggravated conditions. In spite of these difficulties, the cylinder lubricants have to perform their duties. It must be remembered that the cylinder lubricants are used only as a once-through oil. That means that they have to accomplish their work in one go, and then they are discharged. Thus for this reason they are heavily loaded and are very expensive. It must reduce sliding friction between the rings and the liner to a minimum, thereby minimizing metal to metal contact and frictional wear. It must possess adequate viscosity at high working temperatures and still be sufficiently fluid to spread over the entire working surfaces to form a good adsorbed oil film. It must form an effective seal in conjunction with the piston rings, preventing gas blow by and burning away of the oil film and lack of compression. It must burn cleanly, leaving as little and as soft a deposit as possible. This is especially true of high additive content oils as unsuitable types can form objectionable ash deposits. It must effectively prevent the buildup of deposits in the ring zone and in ports of port exhausted two stroke engines. It must effectively neutralize the corrosive effects of mineral acids formed during combustion of the fuel. At first glance it would appear that no lubricant, neither mineral nor synthetic, could withstand all above difficulties to fulfill the above requirements, but significant developments in the lubricating oil field have made it possible. This is taken care of by lubricating oil of high TBN values (60-80 TBN). Further it is ensured that the cylinder liner temperature doesn’t go below the dew point temperature of sulphuric acid in the upper zone and thus the corrosion is reduced to a minimum value. Additives to improve dispersancy and detergency have been developed to minimize abrasive wear and ring zone deposits. Multilevel lubrication systems have increased oil film thickness considerably. The inclusion of additives such as polymethacrylates and ethylene-propylene co-polymers (OCP) to improve the oiliness helps in maintaining the requisite oil film thickness due to its molecular bending with porous cylinder liner. There is no non working stroke during which the oil film on the wall can be reformed but this problem has also been solved by improvement in timely oil injection system. A few engine manufacturers have recently developed a timely oil injection system similar to the fuel injection. A typical large engine developing 20000 Bhp with a daily fuel consumption of 76103 Kg burning a 3000 second Redwood No 1 fuel at 100 F and a sulphur content of 4%, the total weight of sulphur burnt would be 3048 Kg or 3 tons. If this were all converted into SO3 and then into sulphuric acid, this would produce 10 tons of highly corrosive acid. But reliable analysis indicates that only 10 to 15 % is converted into sulphuric acid, and that amounts to 450 Kg of sulphuric acid per day which may lead to highly corrosive wear. Cylinder lubricating oil is highly viscous, which hampers its spreadibility thereby resulting in uneven wear on the cylinder liner. It will ultimately lead to blow down which further aggravates lubrication problems. In the next article "Cylinder Liner Lubrication of Marine Two Stroke Crosshead Diesel Engines Part 2," we discuss lubricants and the selection of the lubricants for different types of fuel oils. We discuss the emulsion type cylinder lubricants, the dispersion type cylinder lubricants, and the single phase cylinder lubricants. We also discuss the running in of the rings and the liners in context to the cylinder lubricant. Furthermore, we discuss the trouble-shooting related to cylinder lubrication in two stroke crosshead marine engines.